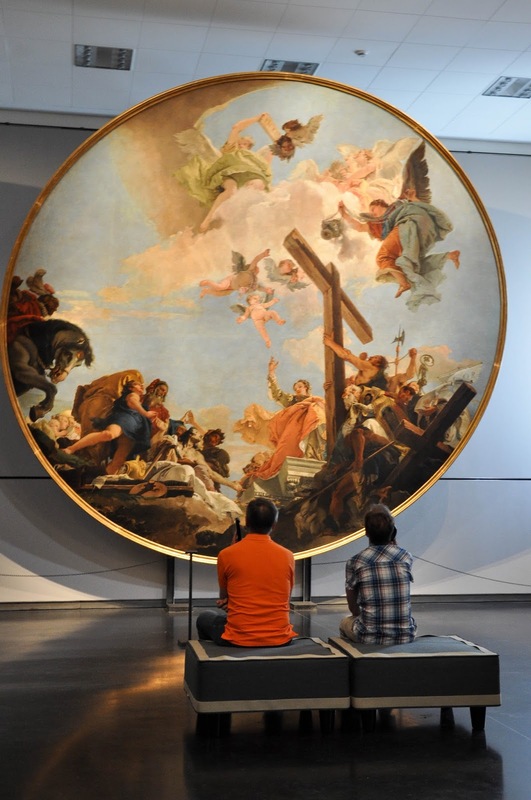 If you love monumental paintings by Italian masters, you will fall head over heels for this place. Sadly, it didn’t work for me quite the same way. 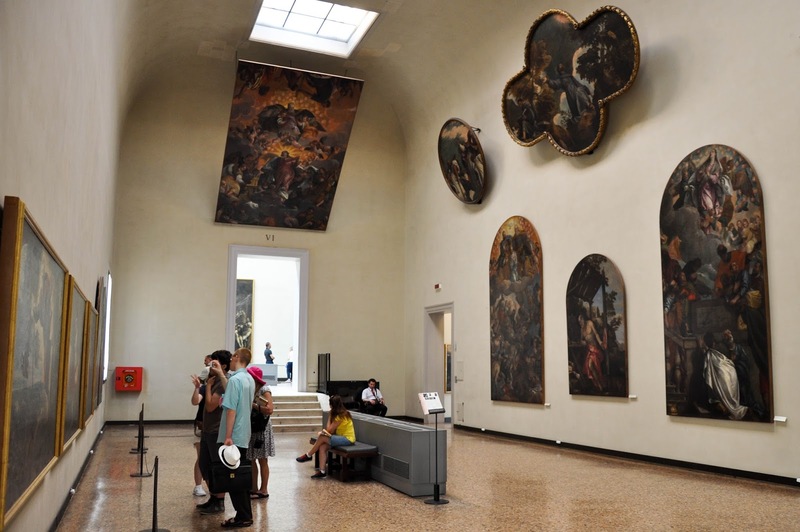 Which is a shame, as I was really looking forward to my visit to Gallerie dell’Accademia in Venice. You see, during all my previous visits to my most favourite city on Earth, I never had the time or the chance to stop by this world famous museum gallery. I had passed by it several times on the way to other splendid places there, but I have never actually gone in. 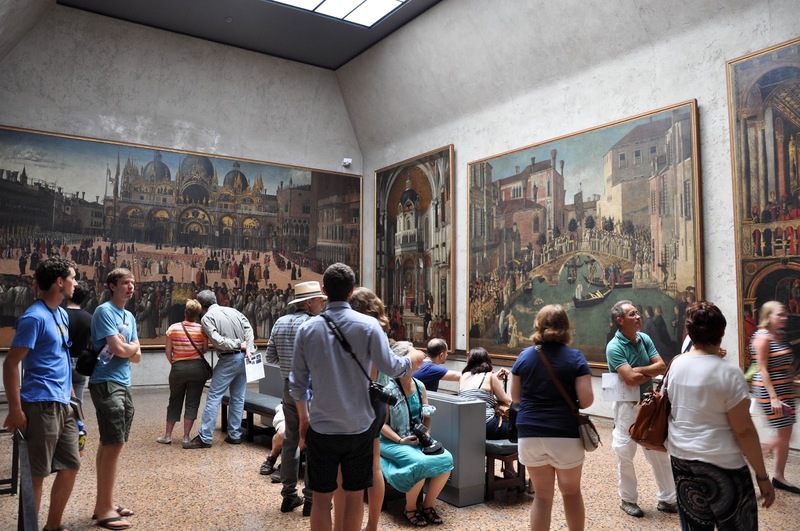 So, when the opportunity arose for me to be in Venice for a day attending a major sporting and historical event, I quickly checked Accademia’s opening hours and decided to spend a pleasant hour or two immersed in its art. 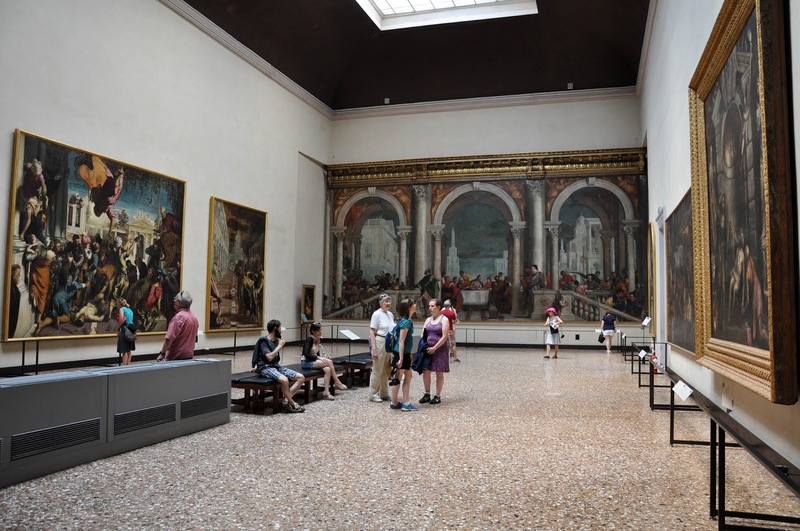 Paintings by Tintoretto, Canaletto, Giorgione and countless other big names adorn its walls. Needless to say, my expectations were high. I approached the museum’s Palladian building in the white glare of the hot Venetian early afternoon. Having just enjoyed a really pleasant visit to the world famous theatre and opera house La Fenice, I was in a fabulous mood but the sun was getting just a bit too much for me. Inside the museum it was nice and cool, people were mingling about, relaxing on the benches by the wall or forming a couple of short queues in order to get a ticket and see the artworks. 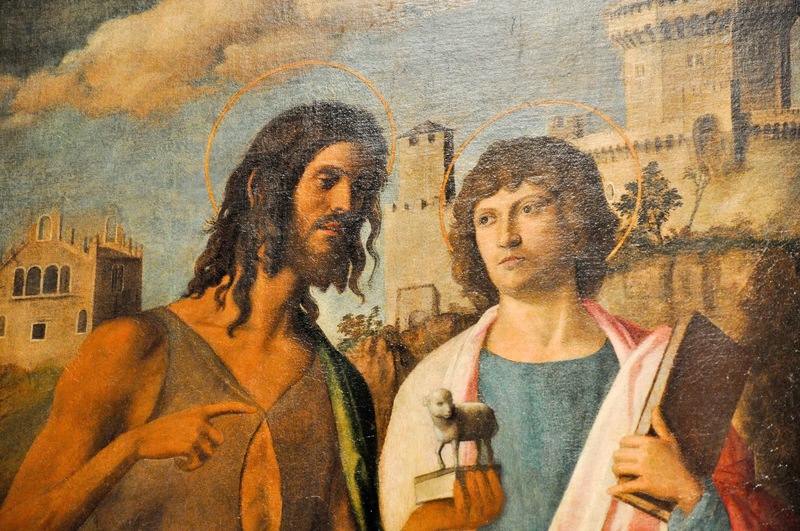 It was the first Sunday of the month and I quickly found out that this is when Accademia is free to visit all day. ‘Quite lucky!’, I thought. Having lived in London for 12 years, where the biggest and best museums are free of charge, I wholeheartedly support the idea that art and artefacts should be easily accessible to all. 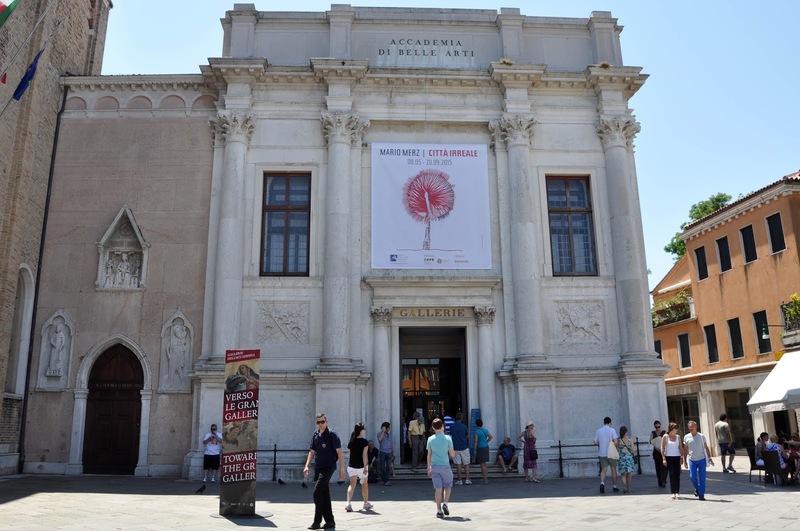 Plus Venice is an expensive city as a whole, so having free access to a museum, even if it is once a month, is still something, don’t you think?! I went up the marble steps and caught a glimpse of the splendid ceiling of the main upstairs foyer. Countless little faces flanked by four pairs of wings were watching me from above. 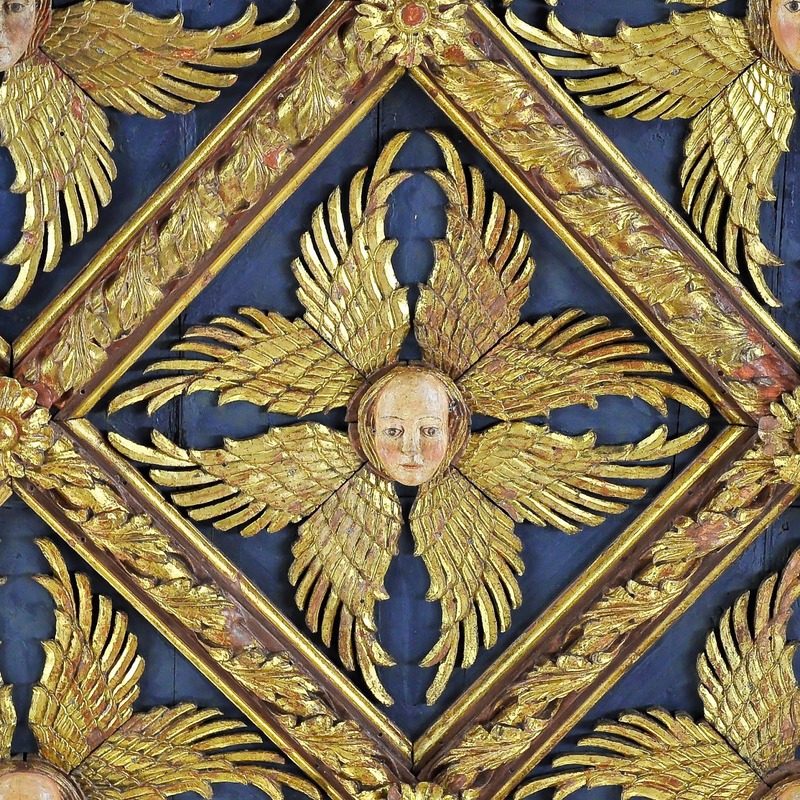 Here and there slightly larger panels were inserted in the ceiling creating focal points among the sea of winged faces. 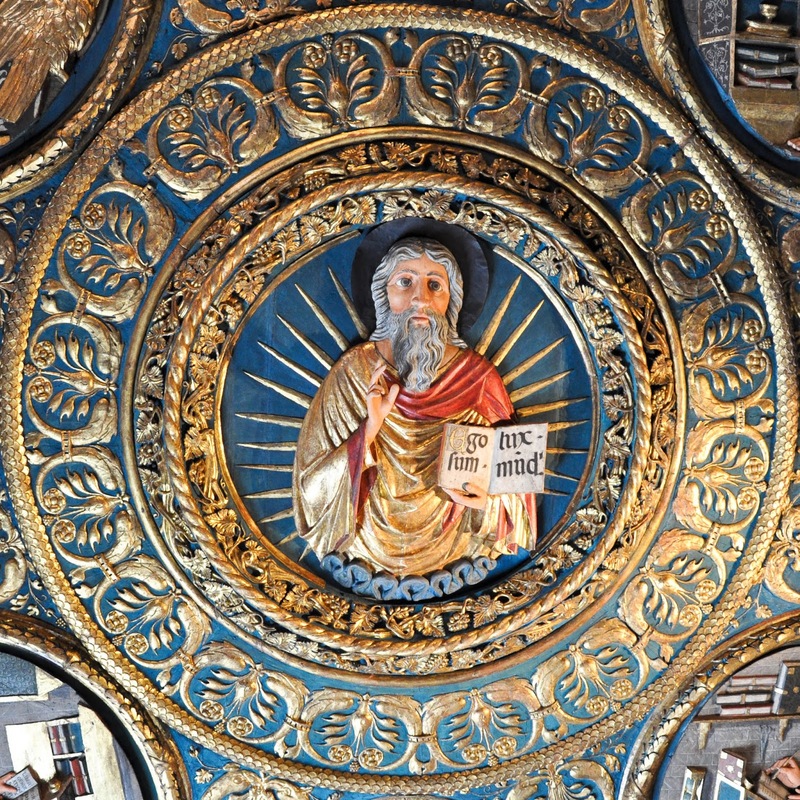 I love it when ceilings have been turned into veritable works of art. 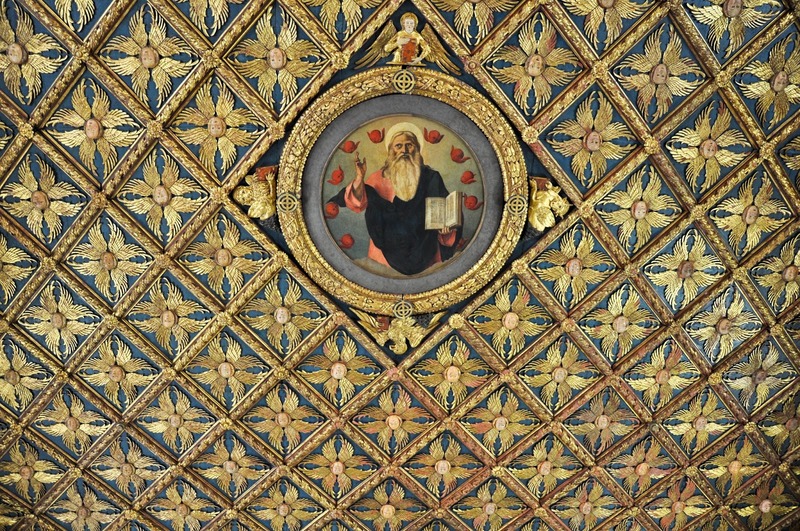 I have seen some truly wonderful examples of adorned ceilings in castles, palazzi and churches all around Italy. They definitely beat the plain magnolia-painted or, even worse, the wallpapered ceilings in some of the houses I have lived in. So, suitably excited, I walked to the top of the stairs and started my visit to Accademia. 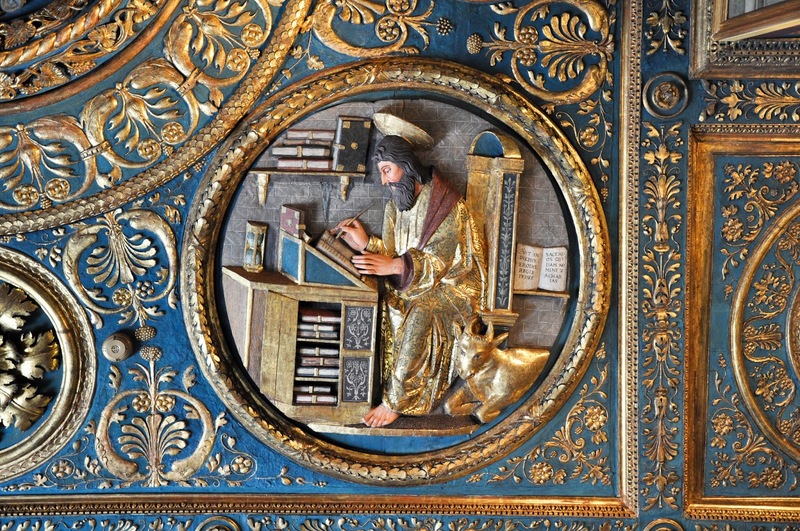 The huge expanse of the upstairs foyer contained many pieces of medieval art. I was particularly attracted to this work by Lorenzo Veneziano. 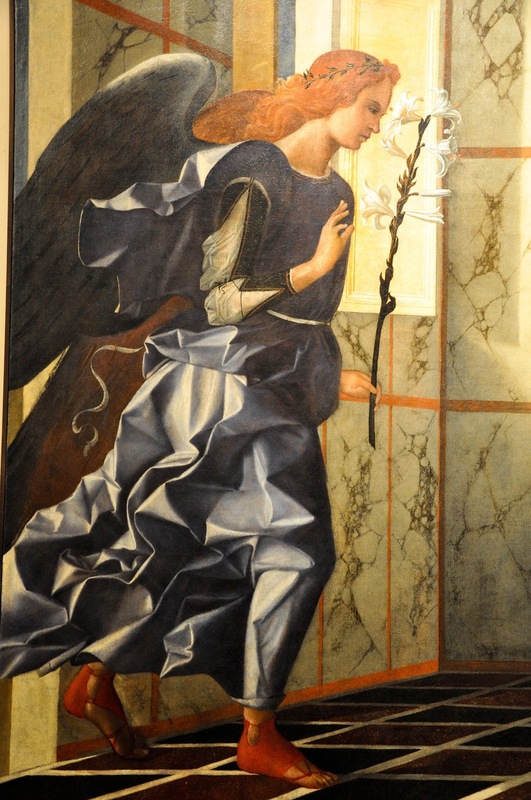 Known as ‘Polittico Lion’ the altarpiece dates back to 1359 and it represents the Annunciation. 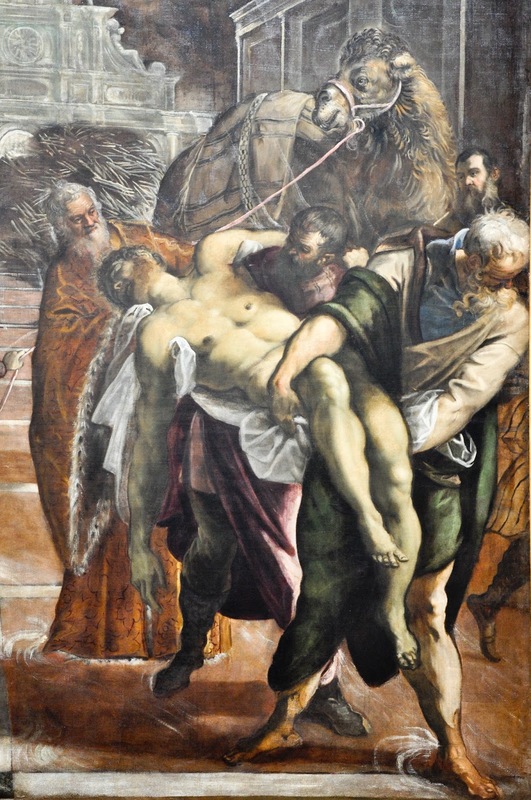 It is named after its donor – Domenico Lion – whose portrait is also included in the work. 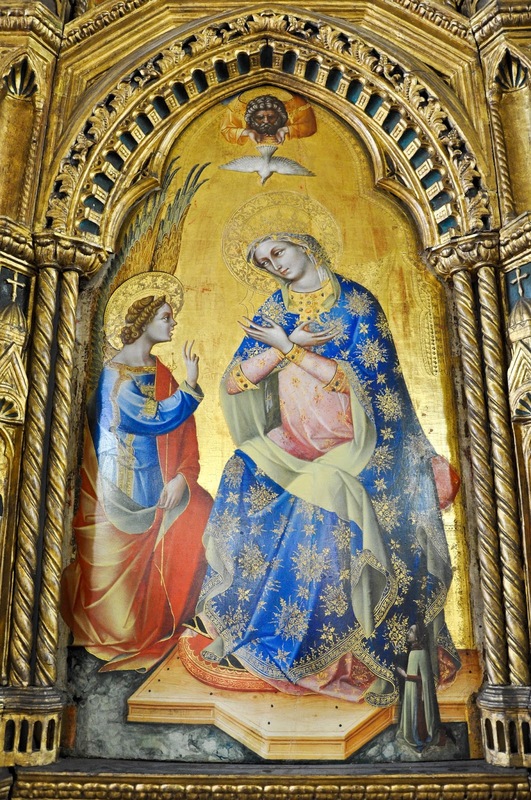 I loved the rich golds, blues and reds and spent a little time just taking it all in, studying the altarpiece panel by panel and simply marvelling at the thought that works of art reach us from many centuries ago and that they have been appreciated, venerated and loved by people who are long gone. Electrified by such a fabulous start to my visit, I delved deeper in Accademia. I was disappointed, to say the least. I walked from room to room to room feeling strangely detached from it all. I didn’t feel excitement at discovering new paintings and new artists. I couldn’t muster the tiniest bit of emotion for finding myself at the bosom of Venetian art. I didn’t experience the cosiness which envelopes you whilst you follow through the snug succession of rooms in the Uffizi Gallery in Florence. I didn’t feel the elation which comes upon you when you explore the majestic rooms of London’s National Gallery. It was all so big and grand and yet so cold and unwelcoming. At least, this is how I felt. Blame it on the sun, of which I had had a bit too much right before walking into Accademia, but I simply couldn’t connect with the place. The art was fabulous, yet it felt like those huge paintings were so close to one another, without much space to breathe, that it was quite easy for it all to become one endless colourful blur. 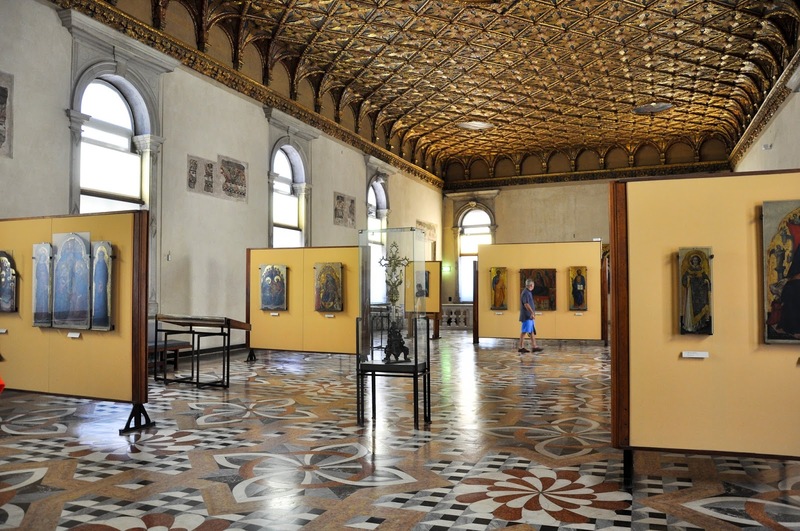 Some paintings had been taken off the walls and several rooms were closed to the public. Had I paid to visit the museum, I would have been rather unhappy about the price not reflecting the fact that a visitor is not seeing it all. People were roaming around tightly clasping audio guides to their ears. Personally, I have an aversion to these little devices. First, you need to listen to an intro explaining how to use them and, inevitably, I manage to press the wrong button at the wrong time and all of a sudden I am listening to the voiceover for a completely different room than the one I am in. Next, I find audio guides really impersonal. I like reading and getting my information in written form. I like signs hanging next to paintings and works of art which I can read in detail or skip through depending on how I feel about the particular piece. I like turning to the person I am exploring the museum with and discussing what we have just read and gauging their reaction and thoughts. There is no such option with audio guides. You need to listen to the voiceover as it is delivered or risk pressing the wrong button yet again if you decide to stop for a bit. Instead of talking to your partner, you both just stare at a work of art struggling to hear what the voiceover has to say. Most importantly, audio guides seem to dictate the speed with which you should progress through a museum. As soon as you finish listening to the voiceover about a room, you feel like you need to move on to the next. 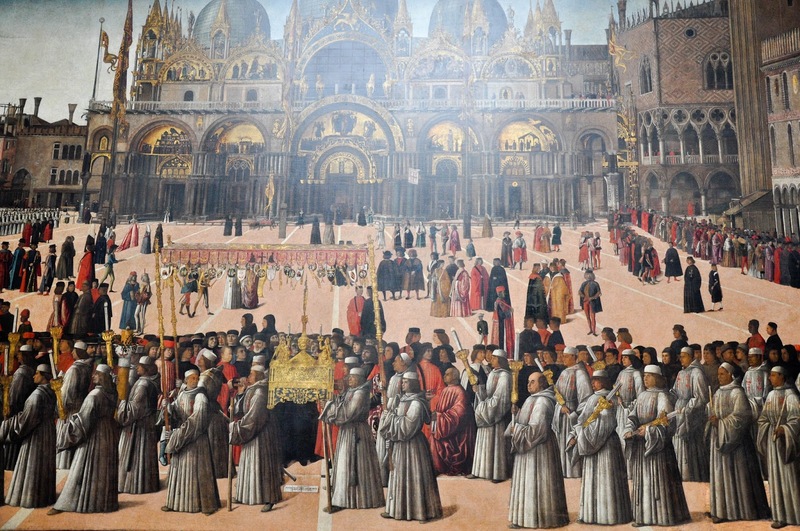 To top it all, audio guides were the only source of information in the Venetian Accademia. Small signs by each painting cited its name, author and respective dates. Nothing else! If you wanted to learn something about the art in Accademia, you had to pay 6 euros for an audio guide. That wasn’t that much, considering that on that day access to the museum was free. However, on any other day you need to pay 15 euros entry fee, so it quickly adds up. I am all for audio guides to be an option in a museum or an art place, but I am against them being used to monopolise the delivery of information to the visitors and charge an extra fee for them. On the train back to Vicenza that same evening I was scrolling through the pictures from Accademia on my camera and I thought: ‘It can’t have been that bad!’. No, it wasn’t. There was some fabulous art there, just the higgledy-piggledy environment and the informational blackout detracted from it. So, to finish on a positive note, here are the five things I loved seeing in Gallerie dell’Accademia in Venice. When I come across the name Bellini, I immediately think of the composer and his world famous opera ‘Norma’. 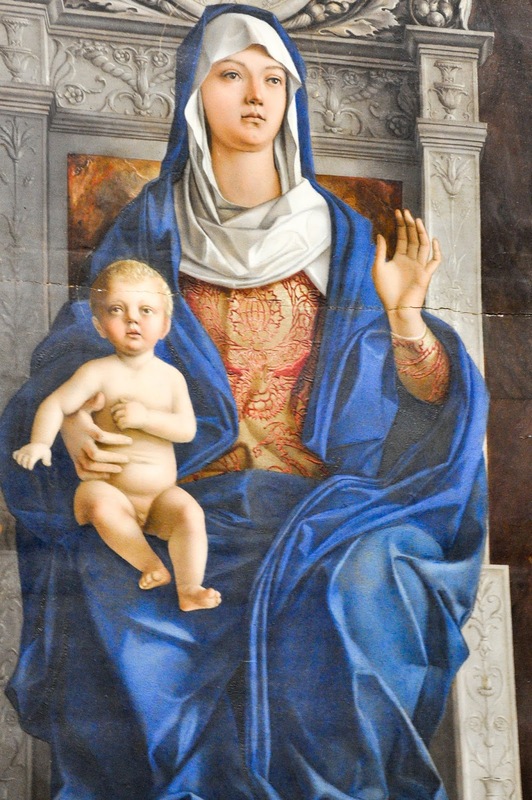 Well, in Accademia I was delighted to discover the paintings of an Italian Renaissance master called Giovanni Bellini. I loved his red-haired angel of Annunciation, the artful drapes of his subjects’ robes, his rich colours, his distinctive style. Well, all two of them. Apart from the splendid ceiling in the main upstairs foyer, I came across one more room with a very intricate work-of-art ceiling. I loved looking at it even though after a while it began to get quite uncomfortable to stand around with my head thrown back and my neck kinked at an excessive angle. You know how they have benches in museums?! 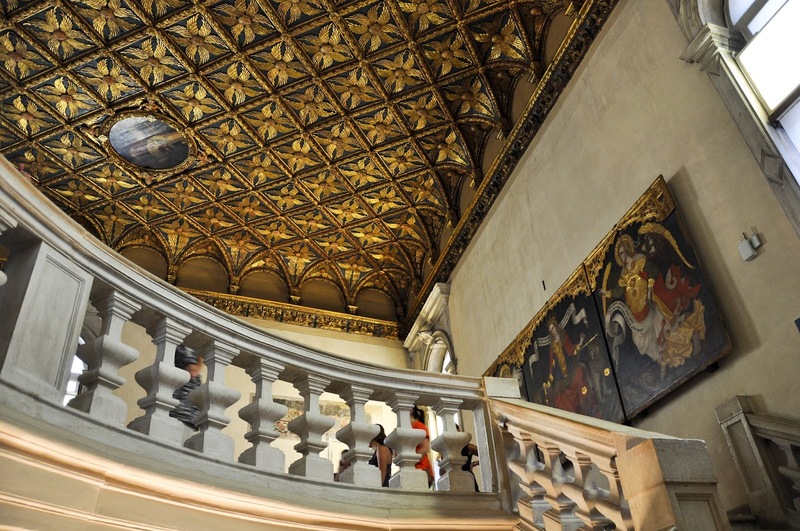 Wouldn’t it be great if they also provided ‘lying-down’ benches for one to admire the fabulous ceilings, too? 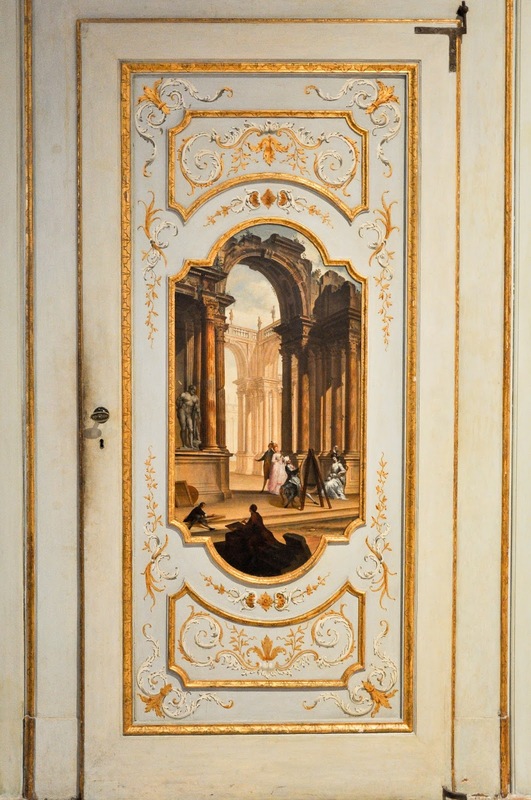 There is a long corridor in Accademia flanked by a row of closed doors. I suspect the rooms which are out of bounds are hidden right behind them. What I loved about these very old looking doors, though, were the scenes depicted on each one of them. They were beautiful! 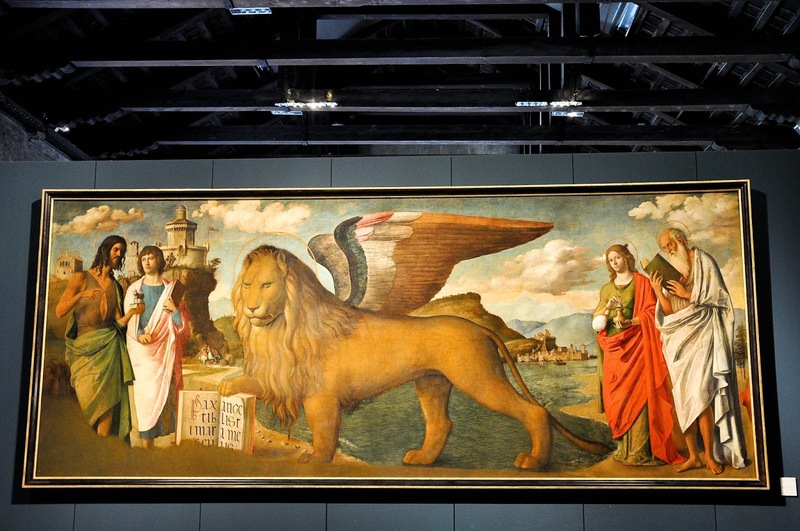 A truly spectacular painting depicting the symbol of Venice – the winged lion of St. Mark’s. 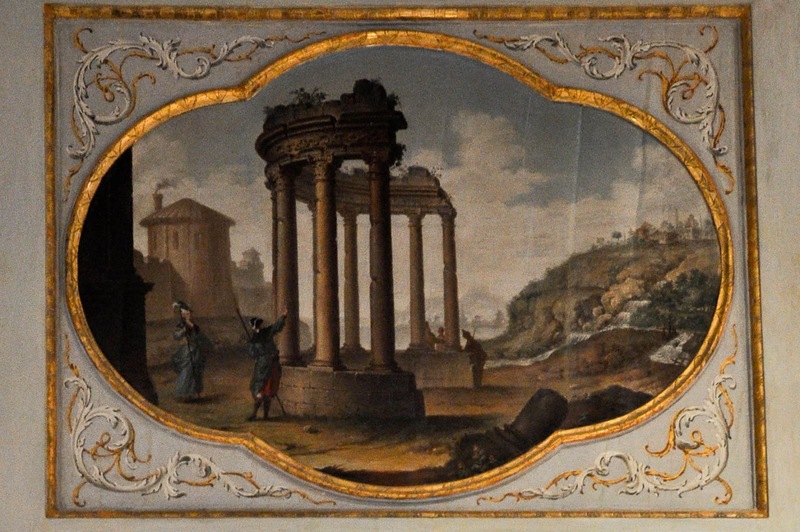 An interesting detail – this amazing composition is painted on a wooden panel rather than on canvass. 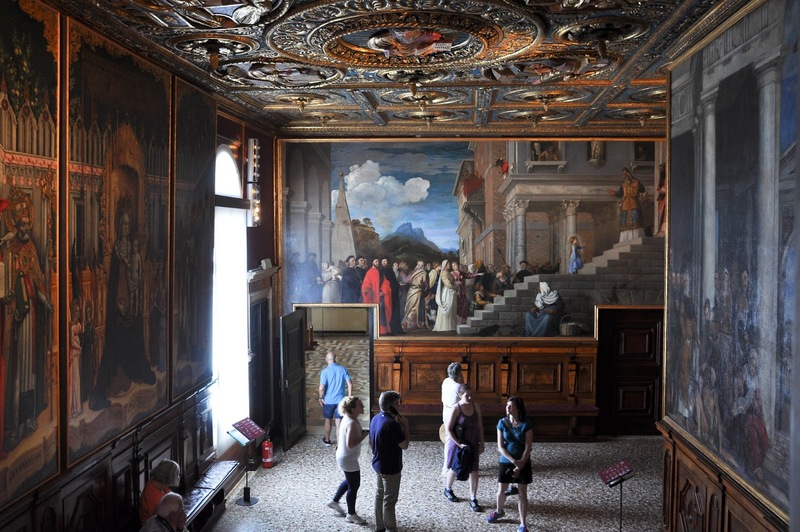 I loved the paintings in this room as they featured Venetian landmarks and scenes of Venetian life as they were several centuries ago. For me, it was interesting to see the city and how life unfolded in it. It gave me a new perspective of Venice and it re-enforced its image of a city of wonder in my mind rather than the idea of a giant amusement park for grown-ups which several contemporary guidebooks are trying to impose on us. My only discontentment with this room was that the paintings were really jammed together in a rather confined space. They were all very big and imposing and it would have been wonderful if there was a bit of breathing space between them all. 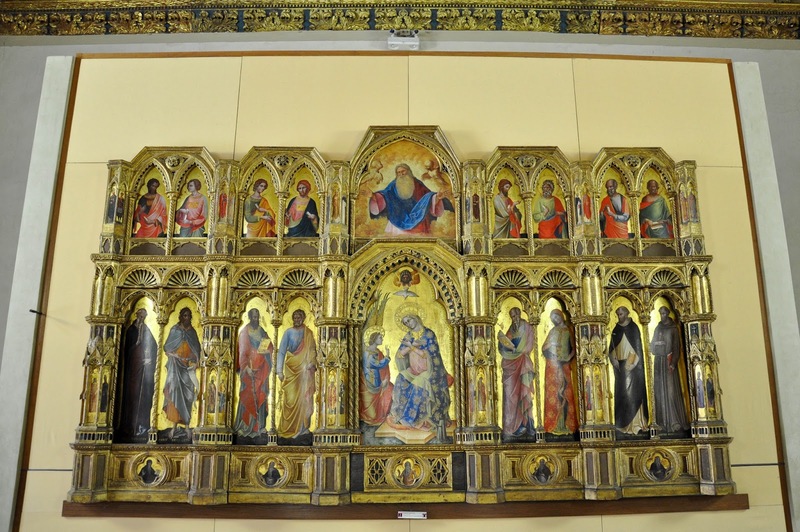 So, these are my personal impressions of my visit to the Gallerie dell’Accademia in Venice. It is an interesting place and I am glad that finally I made it there and spent some time exploring it. Would I go back again? Yes, I would, but to be honest – only if it were the first Sunday of the month. 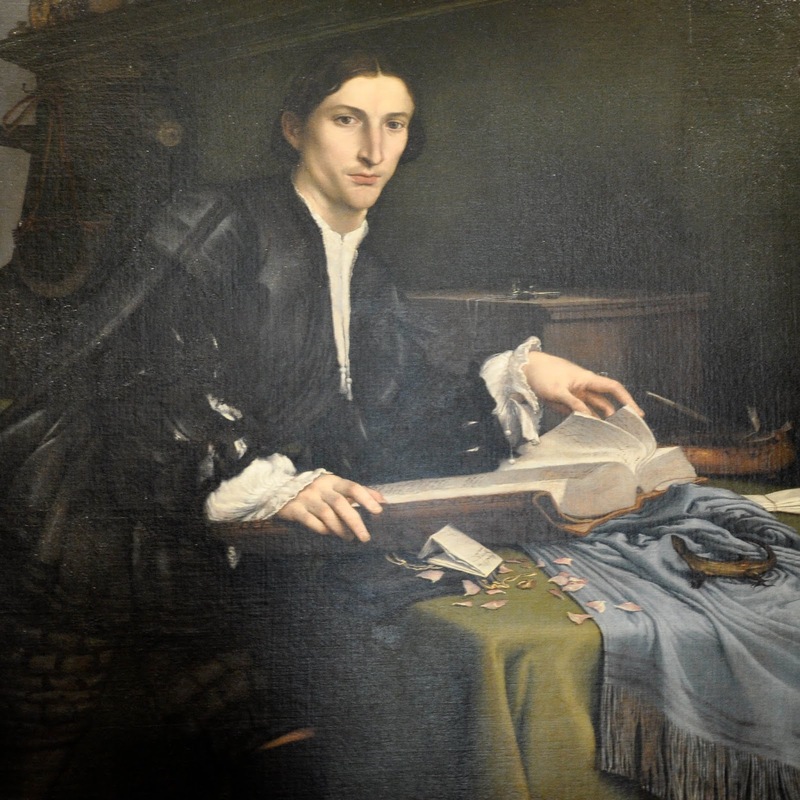 I enjoyed your blog on Accademia and appreciate your choice of paintings displayed, some of which I didn’t experience when visiting the gallery last September. I also agree with your comments about the high cost of their audio guides and the lack of information alongside the paintings other than its title, date, and artist name. Since I couldn’t afford a guide, I would have certainly understood and appreciated the paintings more if additional explanatory written information on the paintings had been provided alongside, as is done in other museums.